THE DEMAND FOR TRANSPARENCY AND ACCESSIBILITY STOPS AT PRIVATE RECORDS. WHEN PUBLIC CONFIDENCE IS AT STAKE, SMART CHANGE STARTS HERE. 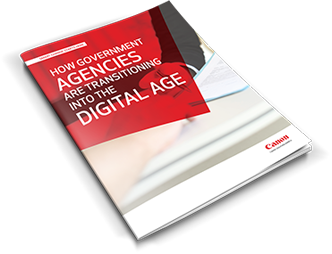 DISCOVER THE UNSEEN ISSUES FACING GOVERNMENT AGENCIES. Learn what Canon Solutions America's security solutions can do to help government agencies innovate for success in this collection of security-focused surveys, infographics, and issue briefs. 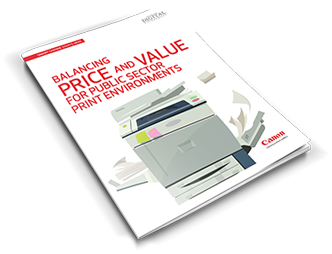 INTERESTED IN FINDING OUT HOW CANON SOLUTIONS AMERICA CAN HELP YOUR GOVERNMENT AGENCY SECURE YOUR PRINTER ENVIRONMENT? SECURE, SUSTAINABLE, AND STREAMLINED. CHOOSE ALL THREE. 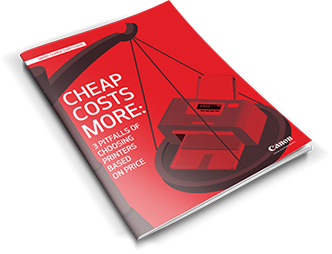 Get the information you need in this free guide. There are three foundational layers of digital transformation. Understanding all three enables a more seamless transformation. 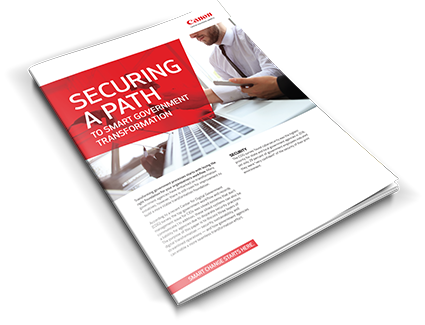 Discover how government agencies rank themselves in security and sustainability, and how they’re streamlining their workflows to reduce operational costs. Read the guide, evaluate your workflow, and build a stable transformation foundation. Download -Issue Brief Title Here-. Download -Survey Results Title Here-. Continue to explore risks and solutions in our government security collection. Canon offers security features that can help your business. Many variables can impact the security of your devices and data. Canon does not warrant that the use of its features will prevent malicious attacks, or prevent misuse of devices or data or other security issues. Nothing herein should be construed as legal counsel or regulatory advice concerning customers’ compliance with laws related to privacy and security. Customers must have their own qualified counsel determine the feasibility of a particular solution as it relates to regulatory and statutory compliance. Some security settings may affect device functionality or performance. You may want to test these settings before deploying them in your environment to ensure you understand their effects.